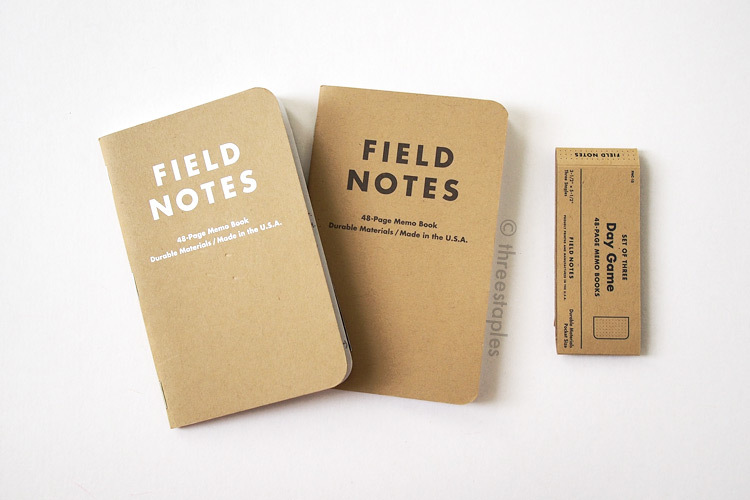 Day Game is the 2012 summer edition of the Field Notes COLORS series, and as the name suggests, it is baseball-themed. I am no baseball fan but I love this edition. No, I ♡♥ this edition, okay. It will probably remain in the top 5 of my ranking forever. As mentioned in my Balsam Fir post, the combination of the matte cover stock and the glossy, foil-stamped type is what does it for me. And colors! Three different books in this edition representing baseball! Outfield Green, Infield Brown, and Hardball White. I don’t care much about baseball, but visually this set definitely hits a home run for me. Yeah, yeah. Har har. If I had to choose a favorite among the three colors, I would choose the green one. But I also appreciate that the infield brown book is a variation on the classic Original brown memo books. It uses the same French Paper’s “Packing Brown Wrap” for the cover, but the key difference is that the type is printed in white instead of black. And there’s an addition of a small home plate design on the back cover. I love this little detail, especially on the white memo book. Another detail I really get excited about in the white book is the dark blue ink (“Pinstripe Blue”) used on the inside cover. Actually, it goes really well with all three colors, so kudos to whoever chose it! There aren’t that many “firsts” with Day Game, except that this is the first time a book was released with a COLORS edition. A Drive Into the Gap by Kevin Guilfoile, who used to work with Field Notes, is the first book published by Field Notes Brand Books, and is also baseball-themed. If you were a subscriber of COLORS or bought Day Game online at Field Notes, then you received the book in your order. Other “regular” retail editions did not include the book, I believe. Day Game is one of those editions I managed to purchase much later, so I do not own the book. Sure looks nice though! The cover matches the green memo book of Day Game and is also foil-stamped. Apparently, this book is the first perfect binding Field Notes ever did. As for “seconds”, there are many. Day Game is the second COLORS edition after Fire Spotter to feature dot graph grid inside. It is the second, after Balsam Fir, to have foil-stamping on the cover. And last but not least, it is the second after Packet of Sunshine to feature different colors of text on the outside covers. Who’s on second? …I will see myself out. Day Game (Summer 2012) is the 15th edition in the COLORS series. Extras: A Drive Into the Gap by Kevin Guilfoile. Subscribers received a copy of the book with their Day Game editions. Also, Day Game editions sold individually on Field Notes website also came with a copy but were priced higher at $12.95 each. Film: A Drive Into the Gap, shot in Polo, Illinois!